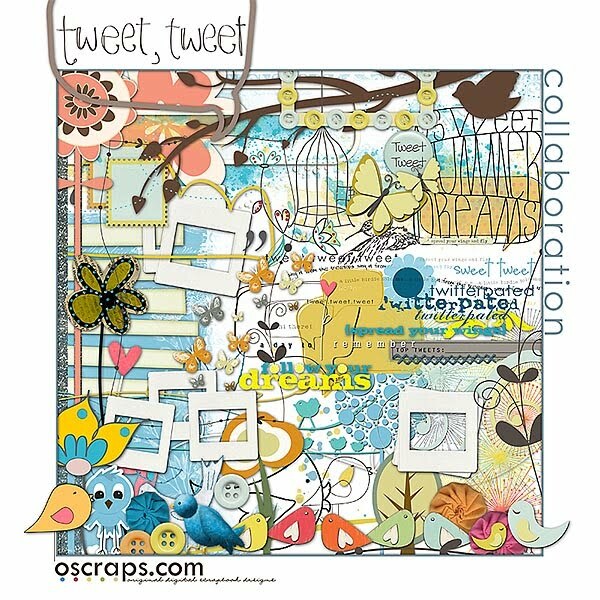 ... oscraps in now on Twitter! OK, so I've no idea what that really means for me or you ... but lots of my very good friends are excited about this, so I figured I'd get excited too!!! Seriously ... although I know NOTHING about Twitter, I'm willing to embrace new technology ... so I've signed up and you can find me @suefalstaff. To celebrate the new venture, oscraps has a fantastic offer ... follow them on Twitter and not only will you get the latest scoop on events and enjoy access to exclusive offers that will only be available via Twitter, but as an extra "thank you", all followers will get this elements pack FREE when they reach 300 followers. What are you waiting for??? Follow oscraps on Twitter! But thanks for the information I'll go and check it out. I'm not on twitter either! Off to check it out though!! I finally figured out how to get it :) Way to spread the word! Great collab Sue. Hope you are well!